In this intriguing book, renowned sociolinguistics experts explore the importance of discourse analysis, a process that examines patterns of language to understand how users build cooperative understanding in dialogues. 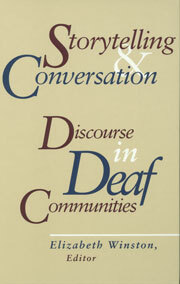 It presents discourse analyses of sign languages native to Bali, Italy, England, and the United States. Studies of internal context review the use of space in ASL to discuss space, how space in BSL is used to “package” complex narrative tasks, how signers choose linguistic tools to structure storytelling, and how affect, emphasis, and comment are added in text telephone conversations. Inquiries into external contexts observe the integration of deaf people and sign language into language communities in Bali, and the language mixing that occurs between deaf parents and their hearing children. Both external and internal contexts are viewed together, first in an examination of applying internal ASL text styles to teaching written English to Deaf students and then in a consideration of the language choices of interpreters who must shift footing to manage the “interpreter’s paradox.” Storytelling and Conversation casts new light on discourse analysis, which will make it a welcome addition to the sociolinguistics canon. Elizabeth A. Winston is the director of the Teaching Interpreting Educators and Mentors (TIEM) Center in Loveland, CO, where she directs research into interpreter education practices, discourse analysis, assessment, and evaluation.